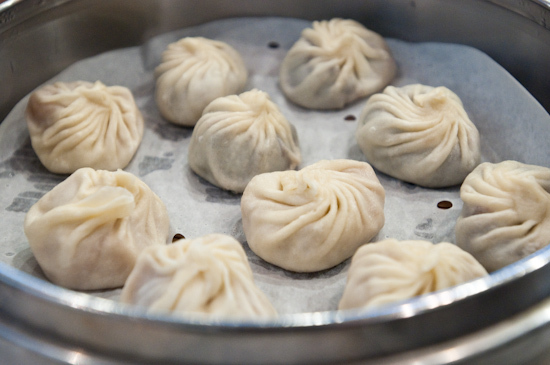 Big food day today starting with the world famous Din Tai Fung dumpling restaurant and followed by one of the highest rated restaurants in Los Angeles - Providence. I'll cover them in separate posts - first is lunch at Din Tai Fung. Lunch: We've long wanted to taste the xiaolong bao (literally "small steamer dumpling" but often translated as Shanghai soup dumplings) from Din Tai Fung (1088 South Baldwin Avenue, Arcadia, CA‎ - (626) 446-8588‎) because a lot of people say they are the best. 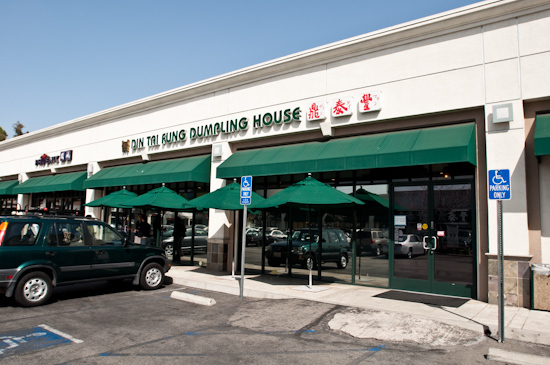 Their original location(s) in Taipei, Taiwan are supposed to be the best, but the Los Angeles location (in Arcadia, CA) is supposed to be quite good. Several people have claimed they make the best in the United States, so we definitely wanted to check it out. 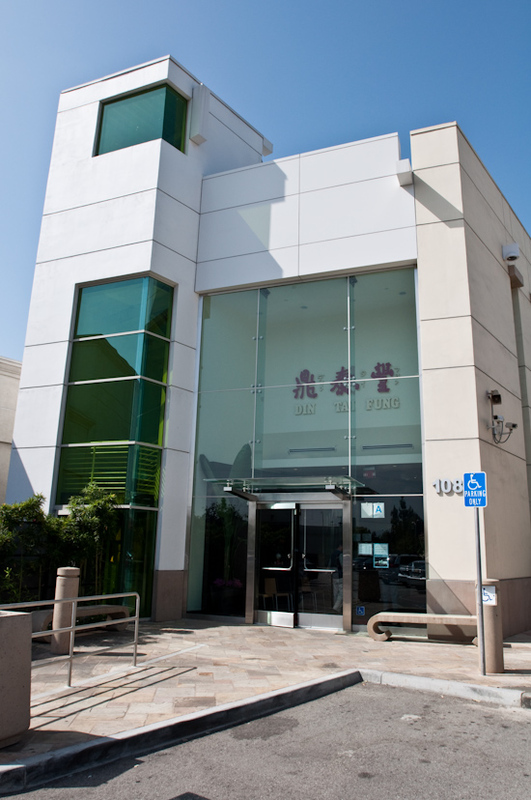 They actually have two locations in Arcadia next to each other. They serve the same food. The original location is in a strip mall and seems more like your typical Chinese restaurant in appearance. 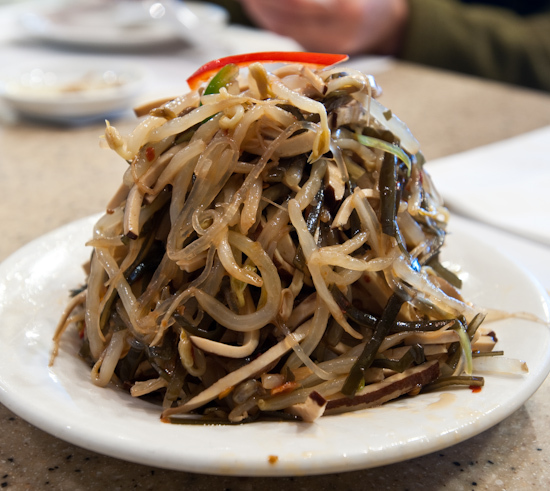 We started with their appetizer which was a vegetable, mung bean vermicelli, and bean curd salad. This was very flavorful and went very well together. Definitely, a good way to start the meal. Since we were their on a Friday, we weren't able to order the "Small Dumplings with Soup" (xiaolong tanbao) but we did order two types of xialong bao. 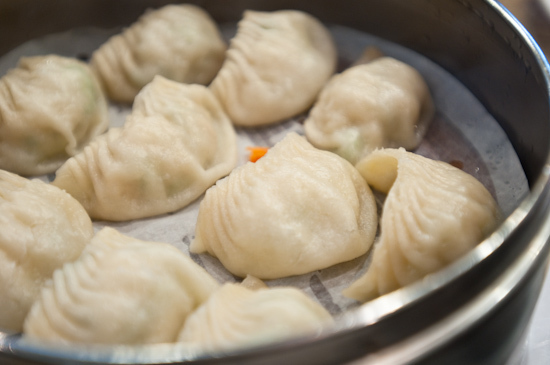 The first was the regular xialong bao - Juicy Pork Dumplings according to the menu. These were flavorful but in a strangely mild way. The individual flavors were there and well-balanced, but unfortunately, it felt a bit weak. 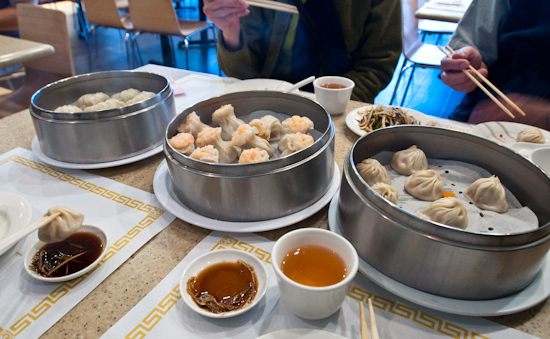 This was the first time I've ever had xiaolong bao at a restaurant where not one of the skins broke (thus releasing the great juice/soup that is wrapped in there with the meat filling) - and we had thirty xiaolong bao. I believe this is because of the drier dough they use to make the wrappers with - unfortunately, that also meant the skins were tougher and in some cases too chewy and dry. This is certainly the best xiaolong bao I've ever had, but it could easily be better. 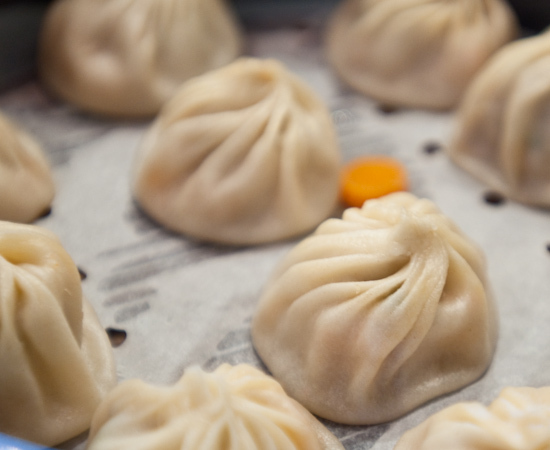 I've had better skins and better fillings and better flavor before (but not all at the same place) - there has to be a restaurant that does xiaolong bao perfectly, and it is not the Din Tai Fung in Arcadia. The Juicy Pork/Crab Dumplings tasted similar to the xiaolong bao but had a stringy texture (from the crab) which I didn't much care for and a strong crab flavor that I didn't think added positively to the xiaolong bao. I preferred the original ones. The Fish Dumplings were very bland and had a mushy texture that we didn't like. The Shrimp & Pork Shiaomai [sic] were a bit of a joke. It didn't taste like any shaomai I had ever tasted before. 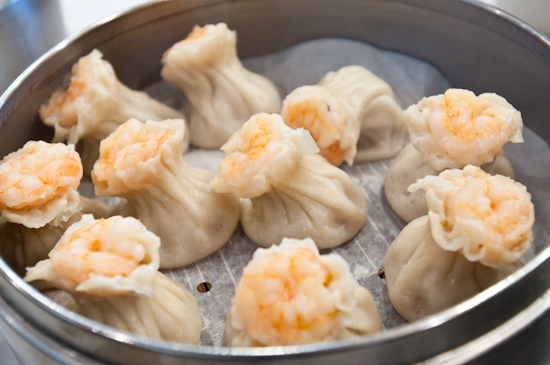 It seemed to me that it was simply the xiaolong bao filling wrapped in the tough dough, pinched (so there is a clump of dough), and a shrimp placed on top. The shrimp and the filling were fine (but didn't taste like shaomai), however, the clump of dough in the midsection was really unappetizing. We ended with an assortment of both Red Bean and Sweet Taro Dumplings which were again wrapped in the same dry and chewy wrappers that the other dumplings were wrapped in. The red mung bean dumplings were okay, but the skins were again too bland and chewy. The taro was much too sweet and devoid of any taro flavor. The only thing worth getting here are the appetizer plate and the xiaolong bao. Pass on everything else. 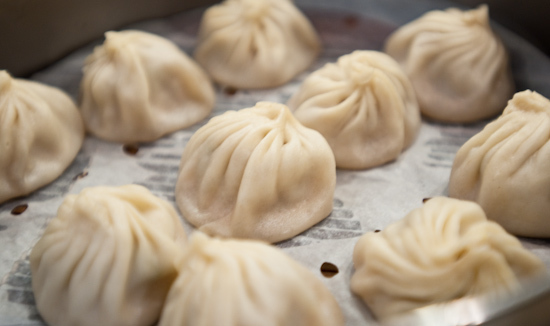 I believe there's a thread on ChowHound that talks about the best XLB joints. DTF may be the standard, but there are others out there that are better.